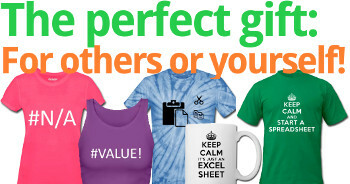 Working with other people on the same Excel file can be challenging. Especially when you prepare an Excel workbook and another person has to fill in some data. In such case, you probably want to make sure that only your intended values are possible to enter. 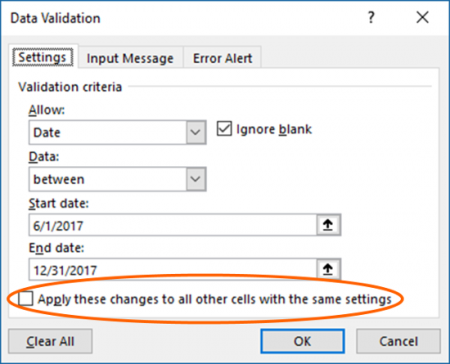 In this article we learn how to restrict cells to certain values with the data validation function. 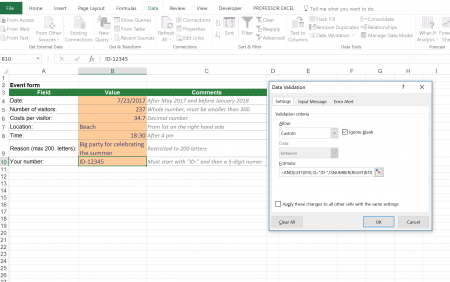 Furthermore we’ll take a look at the example of a cell in which the user has to fill in a complete form. 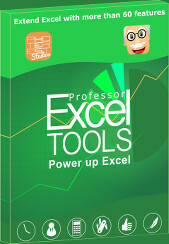 Excel provides the “Data Validation” function. With Data Validation, you can define, what values or what type of values are allowed for each cell (e.g. date, whole numbers). Select the cell(s) you want to limit. Click on “Data Validation” in the middle of the Data ribbon. Alternatively, press Alt –> A –> V –> V on the keyboard. Within the settings tab you can define the allowed values. Let’s say, you want people to enter their date of birth. So there are two limitations: It must be a date and it can’t be any day later than today. Select “Date” on the dropdown list. As we want to limit the maximum value, we have to select “less than” at “Data:”. The end date can either be a fixed date or a formula. In our case we go with the TODAY formula. 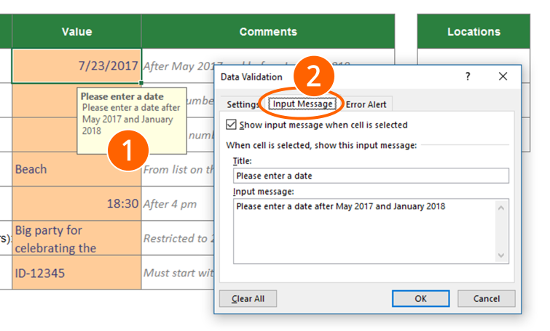 If someone enters a value which is not allowed (for example a date in the future or text), you can define an error message, as well as the message type. 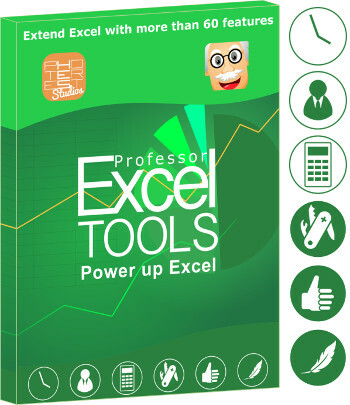 Excel offers the option that you update all cells with the same settings. 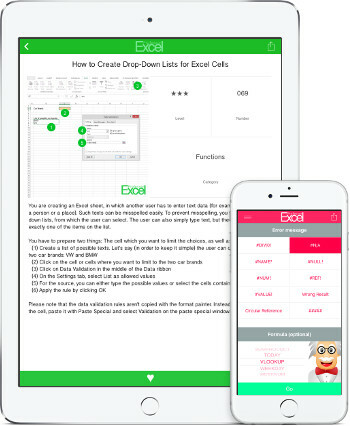 That’s very helpful – you don’t have to find and select all cells you want to change. Just set the tickmark like on the screenshot on the right side. 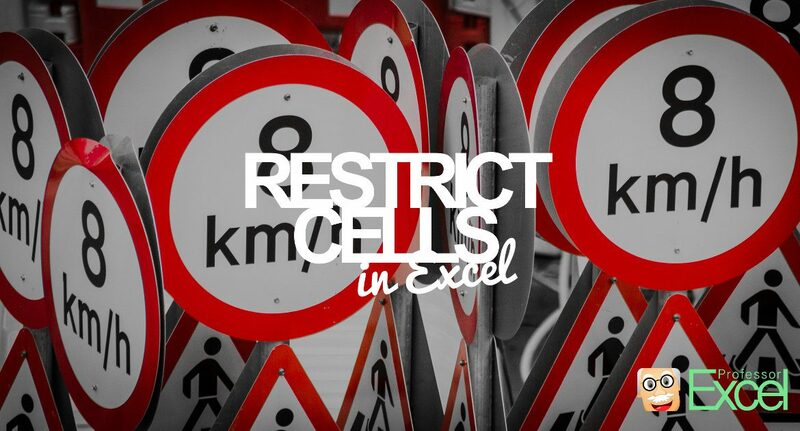 Create a small message for your restricted cell. Your co-worker or client who has to fill out your form will thank you: Provide some help. When you select a cell, a small yellow field will appear with your help text (number 1 on the picture). 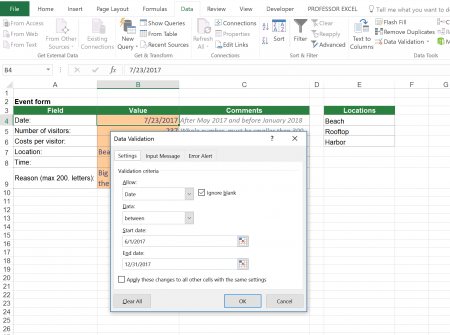 Open the data validation window again by clicking on “Data Validation” in the center of the Data ribbon. Go to the “Input Message” tab (number 2). 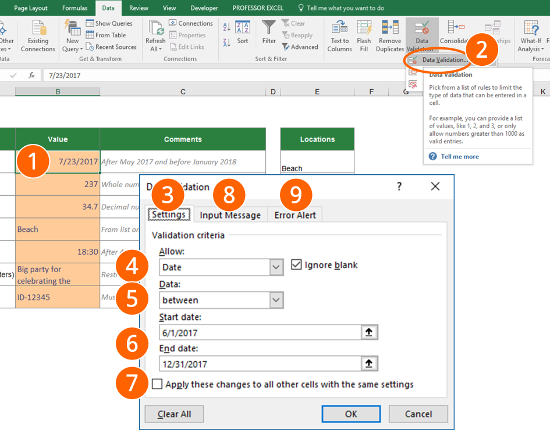 Make sure the tick is set for “Show input message when cell is selected”. Type your text below for a title and the actual input message. Provide your own error message for a wrong data entry. 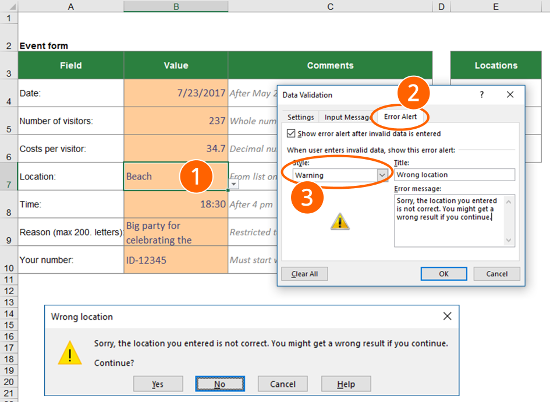 Select the cell you want to provide the error message for (number 1 on the screenshot). Go to the “Error Alert” tab (number 2). Important: If you choose warning, the user can choose to still use his “wrong” value. For stop or information, the user can’t. Type a message title as well as the error message. 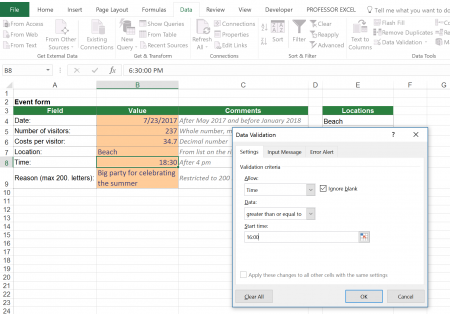 Let’s take a look at an example with many different data validation rules. Our example: restrict the input cells according to the required input. The date of the event should be between May 2017 and December 2018. The number of visitors has to be a whole number and should be smaller than 300. The costs per visitor should be a decimal number less than 100. The location should be selected from the list on the right hand side. The time should be after 4 pm (16:00). The maximum length of the text (in this case the reason) reason should not restricted to 200 characters. Your ID number. This one is special as it should start with “ID-” and being followed by a 5-digit number. Therefore you have to choose the option “formula“. Please feel free to download the example workbook here. 1) Select “Date” under “Allow:”. Under “Data” select “between” if you want to set a start and end date. Select “Date” under “Allow:”. 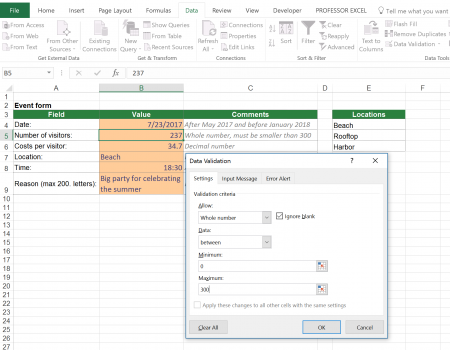 Under “Data” select “between” if you want to set a start and end date. Click on the image to see it large or download the example workbook here. 2) If you want to allow whole numbers only, select “Whole number” under “Allow:”. Furthermore, you can set a minimum and maximum if you choose “between” under “Data:”. If you want to allow whole numbers only, select “Whole number” under “Allow:”. Furthermore, you can set a minimum and maximum if you choose “between” under “Data:”. 3) Very similar to whole number is the allow option “Decimal”. In this example there is only a maximum defined. 4) This option is most popular: The user can select an item from a list. 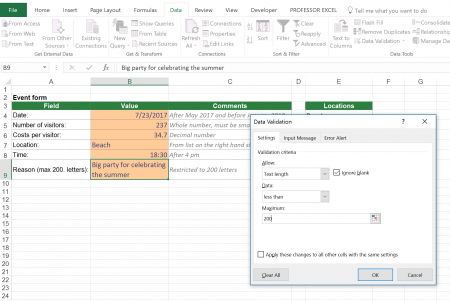 Therefore, you have to allow “List” and link to the list in Excel. Alternatively you can write the possible values directly into the “Source” field, separated by commas. 5) If you want to restrict a time, you can do so by allowing “Time”. Set the Start time in the format “00:00”. 6) Some people tend to write a lot. You can restrict that by allowing a maximum number of letters. Data validation can be quite troublesome when copying sheets from one workbook to another. When you link the condition to another place in the original workbook, you can’t use the “Break links” function (well, you can but it doesn’t work). Please refer to this article in such case.